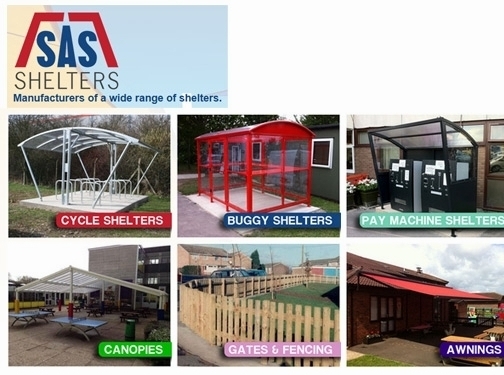 SAS Shelters are manufacturers, suppliers and installers of canopies, awnings and shelters. Our excellent team of CRB checked staff carry out the installation to the correct building standard. SAS shelters has a variety of products that also include buggy shelters, bike shelters, smoking shelters and parking ticket machine shelters. In addition to the products, SAS offers maintenance work on fences, slabs and ground works, general building maintenance and artificial grass. The services offered by SAS shelters cover all sectors such as commercial, industrial and domestic. UK (Luton, Bedfordshire) based business - with over 50 years' experience - providing canopies, awnings and shelters for sale. Website includes catalogue of products (with ability to complete enquiry form), accreditations, terms and conditions, details of business premises, full contact details. Company website has been online since 2010 according to web.archive.org.